FAST, FRIENDLY SERVICE: As a small, family owned company, we offer the fastest service in town! We can usually deliver a dumpster the same or next day, subject to availability. Our smaller trucks allow dumpsters to be placed where larger units won’t fit, and our 10 and 14 yard dumpsters take up less than 1 parking spot in your driveway. 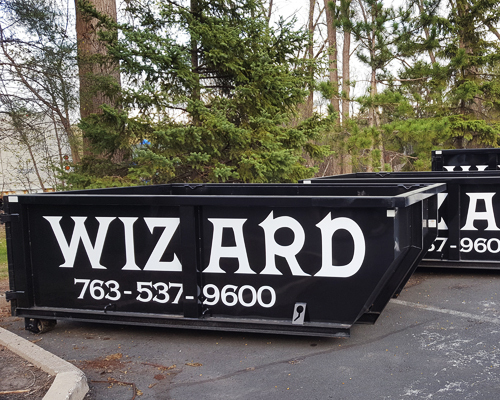 Regardless of whether you’re a contractor renting multiple roll-off dumpsters or a homeowner renting one for the fist time, you’re always on a first name basis with us and will always get our best service! Need it ASAP? Order your dumpster online now! Unlike many of our competitors, we offer straight-forward, competitive pricing. Many companies offer a low “base price” that seems great, until you realize that there are many other “mandatory” added fees, such as drop-off and pick up, fuel surcharges, landfill charges, tipping fees, etc. Our competitive fixed price includes drop-off, pick-up, 1 week rental, and all disposal charges up to the weight limit listed. The only additional charge to our fixed rental price is state and local solid waste management fees (SWM fees vary depending on materials and metro counties’ environmental charges), overweight charges, and hazardous or prohibited items. Use the order link above, proceed to the checkout page, and enter your shipping zip code, to show your total price including taxes. We offer 4 types of disposal: Trash, Demolition, Roofing, Concrete/Asphalt, and dirt/rock. Trash includes all household wastes, garbage, furniture, clothing, etc. excluding hazardous or prohibited materials. Demolition includes building and remodeling debris, excluding liquid paint, varnish, and hazardous items. Concrete/Asphalt is limited to clean material only (no rebar, dirt, or other debirs, and dirt/rock loads must contain only dirt or rock. All items are disposed of in the most environmentally sensitive manner possible. If you have disposal needs for materials other than those listed, give us a call, we’ll be happy to help you! Any type of toxic or hazardous waste, such as oil, gas, or other automotive fluids, fertilizers, chemicals, fluorescent light bulbs or ballasts, liquid paint/varnish, items containing asbestos, etc. Household appliances such as washers, dryers, refrigerators, freezers, microwaves, A/C units, dehumidifiers, etc. Yard waste, tree debris, branches, leaves, grass clippings, stumps, etc if the container is used for household waste or demolition. If in doubt about anything you want to place in the roll-off, please contact us first. While many items on the prohibited list are uncommon, others are not uncommon when performing activities such as cleaning out a residence, but are not accepted by the facilities we haul to. In the case of some of these items, we can still help you dispose of them, but disposal has to occur separately at a different facility and the items cannot be hauled with the rest of the waste. Prohibited items found in the dumpster at the time of pickup will be removed by the driver and left behind on your property. Additional fees will be incurred for the driver’s labor to remove the prohibited items from the dumpster. Items discovered at the time of dumping will be dealt with according to the policies of the particular dump site used; this could mean substantial additional fees, and/or the load being rejected and returned to the customer. You may place your dumpster order, book the days you need, and pay for your rental, all on our website, without needing to call us! When you’re ready to order your dumpster, click the link above. On the next page, select the dumpster usage and size needed, this will bring you to the booking page. On the booking page, select the start and end dates from the calendar, adjust the quantity of bulk items (household waste dumpsters only), enter placement instructions, and click the book now button at the bottom of the page. This will bring you to the checkout page, which works just like online merchandise orders; the billing address must match your credit card, and the shipping address is the address the dumpster is to be delivered to. Dumpsters are generally placed on hard surfaces, out of the right of way, such as a driveway. As roll-offs “roll off” the truck, the area the dumpster is placed requires a clear space in front of it for the truck to deliver it, such as a street surface, driveway, etc. The length typically needed for dumpster placement is about 45 feet. Dumpsters can be placed on soft surfaces (grass, gravel, etc.) at customer discretion. Dumpsters are heavy, and the trucks delivering them are heavy as well, so damage is likely on soft surfaces. Boards are placed under the rear rollers and front of the dumpster to protect the driveway surface. While these boards prevent most common damages from occurring, it is still possible for the dumpster to sink into asphalt surfaces, especially if the surface is deteriorated, and/or when left for long periods of time in the hot summer months. While every precaution will be taken to avoid damage, factors beyond our control, such as driveway condition and changing weather conditions increase the odds of damage occurring. Placing a dumpster on the street is possible, however most metro cities require a permit for dumpsters placed on the street, which can take several weekdays to obtain, and generally incur permit fees assessed by the city. If you’re unsure about placement requirements, please call our office. * Demolition disposal is based on weight, so if you have a lot of concrete, contact us for more cost effective and environmentally friendly disposal options. ** Roofing jobs 2.5 tons (approx 15 squares of 3 tab, or 12 squares of architectural shingles) or greater are priced at $376 (10yd) and $418.40 (14yd) including tax. The maximum weight of a roofing dumpster is 5 tons (10yd) and 7 tons (14yd). Overweight charges are likely if demolition dumpsters are used for roofing jobs. We strongly encourage not combining trash items above with demolition debris, as the entire load is subject to solid waste management fees. Whenever possible, it is best to dispose of waste separately unless you have a large quantity of waste. * Mattresses, box springs, couches, and large chairs/recliners incur extra fees. Mattresses and box springs are currently $50 each, and couches, love seats, recliners, and large chairs are $30 each. These items can be added to your cart at the time of your order. Load items lengthwise, enabling more efficient stacking to best utilize the dumpster’s volume. Avoid placing permeable items, or items that are likely to absorb and hold moisture, at the bottom of the dumpster. Items that hold moisture make the net weight of your disposed items heavier, and could result in overweight charges. Most companies prohibit loading a dumpster above the top rail. We don’t mind, as long as the load can be tarped or strapped in such a way as to prevent items from falling out in transport. If you have large items such as sheets of plywood, and know your load is going to extend past the top rails, save the plywood until last to “cover and contain” the rest of the items in the dumpster. None of the load can extend past the front, sides, or rear of the dumpster. Q: What is the best use for a roll-off dumpster? A: For waste and demolition rentals, we offer 10 and 14 yard dumpsters. Their lengths are 11-12 feet overall, and 8 feet wide. The biggest difference is in height, with the 10 yard units having 39” high sides, and 14 yard units having 51” high sides. We also offer a 7 yard dumpster (12′ long, 8′ wide, and 2′ high) for concrete/asphalt and dirt/rock removal. Due to weight limits, we do not offer larger dumpsters for concrete, asphalt, dirt, or rock. Q: Can I overfill the roll-off dumpster? A: In most cases, no, as over-filled containers are a risk to the driver, and the general public. However, we will generally haul a dumpster that is slightly over-filled, as long as the load is stable, and can be tarped so that none of the contents can fall out during transport, as long as the weight limits are not exceeded. We will not pick up a unit that has debris protruding past the sides, front, or rear of the dumpster. At the driver’s discretion, we will remove overfilled contents as needed to safely transport the container. Concrete/Asphalt and Dirt/Rock dumpsters may not be filled above the top of the container under any circumstances for safety reasons and weight restrictions. Improperly loaded containers that require adjustments to the load by the driver before they can be safely transported will incur an extra fee. The minimum labor charge to adjust dumpster contents is $50. Q: What about shingles or heavy loads that exceed weight limits? A: Roofing materials (shingles) and heavy demolition loads (brick, tile, etc) are handled differently because of their weight, and are transported directly to a demolition landfill, rather than via transfer stations or recycling facilities. Due to this, we treat roofing materials as a separate “category”, with a weight limit of 7 tons. Smaller roofing jobs that are expected to generate less than 2 tons of debris are welcome to use a demolition dumpster at a lower cost, understanding that the overweight charges of $80/ton will apply if the net weight exceeds 1.5 (10yd) or 2 (14yd) tons. Q: How soon can I get a dumpster delivered? A: We can usually deliver a dumpster as soon as the same day! We generally do not charge extra for same day delivery (the exception being a late day or out of area request). Use the order link above, click on the dumpster size you need, and the calendar will show if a dumpster is available for rental during the time-frame needed. Online orders placed before 12:00 noon, with the current day selected as the start date, will be delivered the same day. Orders received after 12:00 noon may still be delivered the same day, subject to our availability, but is not guaranteed. In some cases, especially Mondays and Fridays in the summer, same day delivery may not be possible due to our workload. Weekends are subject to staff availability. Q: When will my dumpster be picked up? A:Your pick-up date will be scheduled at the time of your order, either online or over the phone. Our low flat rates include a one week rental (Monday to Monday for example) on trash and demolition dumpsters (4 days on concrete/asphalt/dirt/rock), so unless a different pick-up date is scheduled, it will be picked up in one week. Additional time, past the week included, is the lesser of $7/day, or $45/week. If ordering online, these amounts will be calculated automatically when you choose your delivery and pick-up dates. If you wish to extend an existing rental, please give us at least 2 business days notice to avoid your dumpster being reserved for another customer. A: We service the entire twin cities metro area. We can deliver a unit within a reasonable distance outside of the metro for a minimal additional charge as our schedules permit. Generally speaking, our service area limits are East Bethel/Forest Lake to the North, Cottage Grove to the East, Apple Valley to the South, and Chaska/Delano to the Southwest/West. Areas outside of these boundaries are serviced based on availability and payment of additional trip fees. Q: Do you offer long term rentals? A: Absolutely! We have remodeling contractors and builders that love our “just right” size dumpsters and fast friendly service! Contractors often keep our dumpsters for the duration of their projects, which can sometimes be months long. Our weekly charge is $45/week for as long as you need the dumpster. We also offer discounts on our weekly rate for contractors and repeat customers subject to availability. We only ask that you keep in touch with us during your rental so that we can keep our scheduling updated. Lastly, keep in mind that many cities require a permit for long term dumpster placement, which may incur permit fees. Q: What things could impact the cost, what could lead to additional charges? A: With our all-inclusive pricing, the only things that add additional cost are prohibited/bulk items, weight overages, and additional rental time. The most common (and most easily avoided) additional charge is labor to remove prohibited items at the time of dumpster pickup. Dumpsters placed on the street also generally incur city permit fees. We do not have any surprise “post rental” fees such as fuel surcharges, administrative fees, convenience fees, credit card fees, fee fees, etc. Our flat rate pricing displayed online is for a 1 week rental (4 days for concrete/asphalt/dirt/rock dumpsters) and disposal up to the weight limits (see the rental page for weight limits). In addition to our flat rates, solid waste management taxes/fees are charged by the state of Minnesota, as well as Hennepin, Ramsey, and Washington counties. These fees are similar to sales taxes in that they are collected by the vendor (us), and remitted to the respective agencies. Solid waste (trash) incurs percentage based tax/fee, while demolition incurs a minimal tonnage/yardage based tax. Concrete, asphalt, dirt, and rock are not affected by these environmental taxes/fees. To calculate the dumpster cost including these taxes/fees, use the online booking feature, proceed to the checkout page, and enter the shipping zip code of where the dumpster will be delivered to display applicable taxes/fees. This does not book a rental until payment is made. Mattresses, box springs, couches, chairs/recliners, and tires incur extra fees of $20-50 for each item. Appliances/TV’s incur fees of $40-$100 per item. If these items are not paid for before dumpster pick-up, the driver will either remove them from the container before transport, and you will be charged for the labor to do so, or we may transport and dispose of them and charge accordingly at our discretion. If these items are discovered at the time of dumping, you will be charged our standard fees per item. Hazardous wastes may not be placed in dumpsters under any circumstances, nor will we risk public safety, dumping facility staff safety, or potential decontamination/cleanup costs by knowingly transporting these items. Any hazardous wastes found in the container at pick-up will be removed by the driver at the customer’s expense. Hazardous wastes found in the dumpster at the time of dumping will incur fees ranging from $400 to several thousand dollars depending on the severity of contamination, cleanup costs assessed by the facility, and whether or not the load is rejected and returned to your property. Hazardous wastes are accepted at most county drop off sites free of charge to residents. Q: Can I move the dumpster after it is delivered? A: No. If you need the dumpster moved after it is delivered, please contact us to make arrangements for us to move it. Attempting to move dumpsters with a vehicle, skid loader, or other equipment could cause damage to the dumpster and the surface underneath it. In addition, moving the dumpster could prevent proper re-loading onto our trucks causing damage to our equipment and/or your property. Q: What items cannot be placed in a dumpster? A: Any type of toxic or hazardous waste, such as paint, fluorescent light bulbs/fixtures/ballasts, oil, gas, or other automotive fluids, fertilizers, chemicals, items containing asbestos, etc. Household appliances such as washers, dryers, refrigerators, freezers, microwaves, A/C units, dehumidifiers, water softeners, etc. Liquids of any kind, even if contained, as containers commonly break open during unloading. Yard waste, branches, tree debris, stumps, etc. If in doubt about anything you want to place in the roll-off, please contact us first. While many items on the prohibited list are uncommon, others are not uncommon when performing activities such as cleaning out a residence, but are not accepted by the facilities we haul to, and in many cases, are regulated by state and local laws. In the case of some of these items, we can still help you dispose of them, but disposal has to occur separately at a different facility and the items cannot be hauled with the rest of the waste. Prohibited items discovered at the time of pickup will be removed by the driver. Items discovered at the time of dumping, will be billed to the customer/charged to the credit card on file, and range in cost from $20-$100 each. All costs of hazardous waste cleanup, decontamination, etc. due to prohibited items are the customer’s sole responsibility. A: Absolutely! On top of our already low pricing, we offer discounts for cash payments, repeat customers/contractors, and military, veteran, police, fire, and teacher discounts. We also discount “empty and return” rentals if a customer ends up needing more than one dumpster for their project. Cash discounts are generally $10-$20, and vary by dumpster usage and size. We’re happy to pass the savings in credit card processing fees back to our customers! Contractors, renovators, and frequent dumpster users, please contact us to set up an account, and get our best deal! Active service members receive a $30 discount; veterans, police officers, fire fighters, and teachers receive a $15 discount off the base price of the dumpster. The coupon codes for these are “military”, “veteran”, “police”, “fire”, and “teacher”, and can be used on the checkout page. “Empty and return” discounts on a second dumpster range from $30-$80, and depends on the location of your property, proximity to a dump site, weight of the first load, and method of payment. This discount does not apply if your second dumpster is not the same unit as the first or is re-delivered on a different day. A: We accept payment by cash or credit card. Payment of the rental rate and taxes must be received on or before the delivery date unless you have a credit account with us. If you have an overage discovered after disposal of your materials, the additional charge will be charged to your credit card, or invoiced due upon receipt (if ordered online). All rentals, including those paid by cash, must have a credit card on file. * Additional charges of $25 per quarter ton (500lbs) apply to overweight household waste loads. ** Additional charges of $20 per quarter ton (500lbs) apply to overweight construction/demolition loads. *** These are strict weight limits and cannot be exceeded. Overweight household waste and construction/demolition loads are charged overweight fees. Overloaded roofing, concrete/asphalt, and dirt/rock loads will not be picked up until corrected, as we will not exceed the rated limits of our equipment/licensing. Q: Can different materials be mixed in one load? A: Generally, no, as loads are hauled to different facilities depending on what they contain, and many facilities handle only certain kinds of loads. If you’re renting a dumpster to be disposed of as construction debris, any household waste (commonly referred to as trash, MMSW or mixed municipal solid waste) placed in the container, will cause the whole load to be disposed of as MMSW, and charged accordingly, with lower weight limits, and applicable taxes/environmental fees applied. While our base rates are the same for demolition debris and MMSW, the taxes and weight limits are not. Demolition loads may contain concrete (keep the weight limits in mind), but concrete/asphalt and dirt/rock loads may not contain any trash or demolition debris. Compost and yard waste cannot be placed in any demolition or household waste dumpsters; processing facilities are unable to sort these loads, and will reject loads with mixed materials. Compost, tree branches, and yard debris must be recycled separately in accordance with state law. Dumpsters rented for roofing materials may contain other demolition debris, but may not contain any household waste or yard waste. Q: How do your dumpsters compare to bagsters? No doubt, the bagster is marketing genius at work, but from our experience, they’re only a good value if you have a very small amount of stuff/debris to dispose of. Bagsters hold a maximum of 3 yards, and ask anyone who’s ever thrown anything away how quickly a bagster, dumpster, pickup truck, etc fills up, and you’ll quickly realize they’re not a good value for the consumer. Take the initial cost of the bag ($30), combined with the $120-$150 pickup cost, and you have an effective “per yard” rate of $50+. Compared to our 10 and 14 yard dumpsters at our fixed rates, the cost per yard via bagster is nearly double the cost of a dumpster ($29/yard in our 10 yard dumpster, and $23.50/yard for our 14 yard). Add to this the fact that bags are clumsy and hard to fill compared to a dumpster, the irresponsibility in adding more plastic to our landfills unnecessarily, and the notion of spending $30 on something just to throw it away, we believe the bagster is bad for the consumer’s wallet and the environment. We won’t even get started with how profitable bagsters are for waste management having to only visit the customer property once for pickup, rather than twice for traditional dumpster drop off and pickup. Then again, if all you need to dispose of is less than 3 yards (about the volume of a pickup truck bed), the bagster comes out cheaper than renting a dumpster. With our experience of our customers rarely wishing they had ordered a smaller dumpster, and the fact that most bagster customers rarely have just one by their curb, we’d say the big green bag is a great idea… for it’s inventor!